Forget voodoo, zombies and Baron Samedi, the real magic among the islands and jungles of the Caribbean comes from Creole cooking. A strange and wonderful combination of food was brought here from all corners of the world as Empires and Republics vied for control of the trade routes, harbours and plantations. Indian spices arrived with indentured labour from the subcontinent and mixed with West African ingredients planted by slaves. Local ingredients such as Mexican chillies and sweet potato where thrown together with court-boullion and spicy sausages from the Mediterranean, and there is the vividly coloured local seafood, fruit and vegetables. Forget NYC or London where cuisines are largely (if not totally) kept separate, here they’re thrown together in a great melange of flavour, colour and ingredients. And it’s the perfect spicy summer food, filling the kitchen with aromas redolent of heady humid sunshine and a gloriously clear light. This is the sort of food that I like to cook up slowly over a couple of days. That way the flavours get to gently mingle and seep into one another, building layer after layer of taste into the dish. Then as you eat, they explode over the tongue and down your throat. Different heats, spices and textures all combining as you chew and swallow. The end result is less oily than many Indian curries, thicker than a Thai one. And the flavours seem to be more combined … that’s not quite the right word though. Let me try again. Many Indian and Thai curries successfully balance a number of different flavours and tastes that unfold as you eat them – hot chillies, smooth cocunut, nutty cumin, rich cardamom, citrussy lime leaves and so on. This Creole curry melds all those flavours together to create something that I can only describe as ‘curry flavour’ – a sort of rich and pungent brew with a slightly fruity edge to it. Even the solid ingredients start to lose their definition in the long slow cooking process, pork softens, sweet potato virtually disintegrates while the regular sort becomes distingly fuzzy around the edges. And everything takes on a wonderful yellowy brown hue of cumin and turmeric with dots of orange and red suspended in the thick lava-like sauce. It’s a good metaphor for the cuisine and region as a whole, a spicy brew, one-pot cooking, a long slow melding of disparate ingredients into a whole greater than its parts. The basis for this came from a winderful new book I got called Creole by Babette de Rozières. I changed the veg and the spices a bit, but the method is all hers. You could do this with all sorts of veg – courgettes, tomatoes, green beans, anything that mixes well in a curry. Like most curries and casseroles, this benefits from being left overnight for the flavours to really meld. That way your meltingly tender pork and disintegrating tubers really take on the character of the spices. However, this can make the whole thing a three day process. Not much work to make it though and well worth the forward planning. I use Seasoned Pioneers Columbo curry powder spice mix because both my spice grinder and my pestle and mortar are broken. It is basically a mix of mustard, cumin, coriander, allspice, fenugreek, nigella and black pepper. Madhur Jaffry has a recipe in her curry bible. Mix the pork with the marinade ingredients, cover with clingfilm and leave overnight in the fridge (or for a few hours on your kitchen counter). Heat a glug or two of oil in a casserole dish and stirfry the pork chunks over a medium heat for about 7-10 minutes. Pour over the stock and bring to a simmer. Add the onion, garlic, pepper and curry powder, mix well and bring to a vigorous boil, then cook for about 15 minutes. Reduce the heat to low, add the chilli, potato, sweet potato, aubergine and herbs. Simmer gently for about 40 minutes. At this stage you can remove it from the heat and leave it overnight for the flavour to really develop. If you do that, reheat the next day before carrying on. Remove all the solid ingredients and put off to one side and keep warm (I do this in a 75-100oC oven, in a dish covered with foil). Mix the cornflour with a little cold water and bring the curry sauce to a low boil. Add the cornflour mix and stir until the sauce thickens. Taste, and if it isn’t hot enough add some hot shilli sauce. I use about half a teaspoon of a vicious habanero chilli sauce. Add all the solids back in, removing the herbs, make sure they are heated through and then serve on beds of pillowy soft steamed white rice. Never had Columbo curry before, but I’m imaginig it’s similar to Japanese curries which are also fruitier than their South Asian cousins. Also, I did want this to be about Peter Falk but then I’m odd. @meemalee – I fear that may be down to my spelling guesswork on the title – it may by Colombo (as in Sri Lanka) not Columbo (as in private detective). I also initially thought this was Sri Lankan from the name and then like meemalee, I thought of a detective in grubby mac. Whatever, it looks damn tasty and I’m wondering whether or not I should have included a Caribbean section in my “World Cup – The Excluded” post. That looks great!! Actually looks like a Malaysian chicken curry that I make and I also love slow cooking things.. everything just magically becomes soft and tender. now THAT’S magic… a good goddamn slow cooker! @Mr Noodles – heh, i am fooling a lot of people it seems, hopefully not too many disappointed folk though. Caribbean – would they be playing in a sort of combined team like the West Indies in cricket? @catty – thanks! 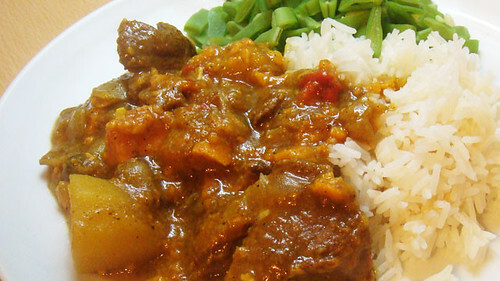 It’s absolutely the best way to make curries – slowly slowly slowly – on a glacial scale of speed if you can do it. Luverly. And the slow cooker – the Paul Daniels of the cooking world? I think Sri Lankan cooking has been over looked for far too long, it’s been over shadowed by its northern and far larger neighbour. Which is a shame as the food is really good. This recipe looks like a winner, gonna have to give it a try when I return. @Dave – i agree with that, and I’m glad you like the recipe.